We’ve just returned from a brief holiday visiting family in Alice Springs, which included a two day stopover in Adelaide on the way. While we were strolling through the Adelaide Botanic Gardens we came across the Santos Museum of Economic Botany and decided to have a look. Apparently such museums, demonstrating the variety and usefulness of plant material from around the world, were once commonplace in botanic gardens throughout the English speaking world. Now the Adelaide museum, opened in 1881, and lovingly preserved and restored, is a unique example . Entrance is free, but this probably isn’t a place you’d want to take a hyperactive six year old. We felt as if we were reliving our childhood experience of museums. There are one or two interactive exhibits, but the collection consists mainly of traditional wooden display cabinets topped with glass, containing collections of dried plants and seeds, oils and wood samples. Many still have hand-written labels. The realistic looking examples of fruit and vegetables scattered among the displays are actually papier-mache models. What the museum demonstrates is that, despite the wide variety of environments in which human societies have developed, each has found local plants suitable for food, medicine, building, furniture, fibres, clothing and shall we say ‘relaxation’. It’s a fascinating and informative collection. Quite coincidentally, my holiday reading was “The Invention of Nature“, a biography of the Prussian scientist and explorer Alexander von Humboldt, by Andrea Wulf. Humboldt was a frenetic traveller, collector of specimens and cataloguer of facts, who broke the mould of scientific writing by producing colourful, poetic accounts of his discoveries. In nineteenth century Europe he was a celebrity and his writing influenced Charles Darwin, Henry David Thoreau, John Muir and many others. He no doubt also helped make Museums of Economic Botany popular. 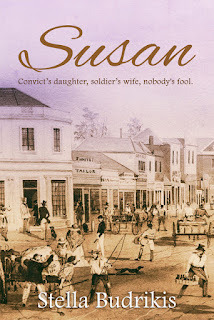 Susan tells the fascinating story of Susan Whybrew, nee Mason, and her Irish-Australian family. It's available in paperback and a variety of ebook formats. Copyright © 2019 Stella Budrikis. Powered by WordPress. Theme: Spacious by ThemeGrill.